Party leaders in the United Kingdom have been urged to support a veterinary campaign to end non-stun slaughter. Writing to party leaders, Robin Hargreaves, President of the British Veterinary Association emphasised the animal welfare issues involved in non-stun slaughter and the strength of public feeling about the issue – since the launch at the end of April of the BVA’s UK-wide petition to end non-stun slaughter in the UK, over 72,000 individuals have signed. 100,000 signatures are needed to trigger a House of Commons debate. European and UK legislation requires all animals to be stunned before slaughter to render them insensible to pain. However, an exemption in UK law allows animals to be slaughtered without stunning for certain religious communities – Dhabihah slaughter for Halal food and Shechita slaughter for Kosher food. It is important to note that almost 90% of Halal slaughter in the UK is already pre-stunned. Scientific evidence shows that slaughter without pre-stunning compromises animal welfare. That is why the Humane Slaughter Association, the Farm Animal Welfare Council, the Federation of Veterinarians of Europe and the European Food Safety Authority are all calling for an end to non-stun slaughter. In letters to Alex Salmond, Johann Lamont, Ruth Davidson and Willie Rennie, Mr Hargreaves was at pains to underline the campaign’s focus on animal welfare at slaughter, stating that:“We have always made it very clear that we are not concerned with the practising of religious belief, but with the throat cutting of animals that have not been rendered insensible to pain.”The need to differentiate between non-stun and religious slaughter in relation to food labelling was also highlighted to Scottish Parliament leaders by Mr Hargreaves:“Recent media coverage has revealed a very strong feeling amongst the general public for better labelling about the provenance of food they are buying and eating. We very much hope you will listen to this sentiment and take forward the debate about clearer food labelling.“Proposals to label all Halal and Kosher products will do nothing to inform the public about the very proper concerns regarding welfare at slaughter and could fuel further confusion and potentially feed prejudice. “Halal labelling does not recognise that around 88% of halal slaughter in the UK is pre-stunned. At the same time the 12% that isn’t stunned, along with the hindquarters of animals slaughtered by the Shechita method that are not Kosher, could continue to enter the mainstream food chain unlabelled. Ronnie Soutar, President of the BVA Scottish Branch, said: “Concern about welfare of animals at slaughter is one of the top priorities for our members and we have long advocated an end to non-stun slaughter. Although very little non-stun slaughter takes place in Scotland that is no assurance that non-stun products aren’t on Scottish supermarket shelves or sold in food outlets. Scottish party leaders are in the process of responding to BVA’s call for a cross-party consensus on the issue in Scotland and BVA hopes to work with all parties in the Scottish Parliament to support better consumer information and improved animal welfare. Hargreaves said: “BVA has long held the position that slaughter without pre-stunning unnecessarily compromises animal welfare at the time of death. We are also concerned that meat from non-stun slaughter is entering the market unlabelled because there is no requirement to label meat and meat products with the method of slaughter. We believe strongly that food should be labelled as stunned or non-stunned and we are delighted that the all-party group supports the BVA call for clearer labelling. “The issue of non-stun slaughter continues to generate media and political interest, and rightly so. Scientific evidence shows that slaughter without pre-stunning compromises animal welfare; a position supported by the Humane Slaughter Association, the Farm Animal Welfare Council, the Federation of Veterinarians of Europe and the European Food Safety Authority. We have a moral obligation to each animal we keep: any unnecessary pain should be eliminated. “The all-party group’s inquiry also identified several areas where greater research is needed and we would welcome in particular further work to gather evidence on the recoverability of certain stunning methods to reassure some religious communities that they are compatible with their requirements. President of the British Veterinary Association (BVA), Robin Hargreaves is urging political leaders in Wales to get behind a vet-led campaign to end the cruel non-stun slaughter of livestock. Writing to party leaders at the National Assembly, Mr Hargreaves emphasised the animal welfare issues involved in non-stun slaughter and the strength of public feeling about the issue. European and UK legislation requires all animals to be stunned before slaughter to render them insensible to pain. However, an exemption in UK law allows animals to be slaughtered without stunning for certain religious communities – Dhabihah slaughter for Halal food and Shechita slaughter for Kosher food. Almost 90% of Halal slaughter in the UK is already pre-stunned. Since the launch at the end of April of the BVA’s UK-wide petition to Defra to end non-stun slaughter, over 72,000 individuals have signed; 100,000 signatures are needed to trigger a House of Commons debate. He writes: “Recent media coverage has revealed a very strong feeling amongst the general public for better labelling about the provenance of food they are buying and eating. We very much hope you will listen to this sentiment and take forward the debate about clearer food labelling. “Proposals to label all Halal and Kosher products will do nothing to inform the public about the very proper concerns regarding welfare at slaughter and could fuel further confusion and potentially feed prejudice. He said scientific evidence shows that slaughter without pre-stunning compromises animal welfare. 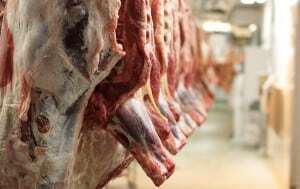 And the RSPCA, the Humane Slaughter Association, the Farm Animal Welfare Council, the Federation of Veterinarians of Europe and the European Food Safety Authority are all calling for an end to non-stun slaughter. Rob Davies, president of the BVA Welsh Branch, said: “Concern about the welfare of animals at slaughter is one of the top priorities for our members and we have long advocated an end to non-stun slaughter. “We are hoping to gain cross-party support for our campaign from the main parties in Wales because this is not only a major animal welfare issue but one of consumer choice and confidence in the food chain. Welsh party leaders are in the process of responding to BVA’s call for a cross-party consensus. We continue to remain concerned that as president of the British Veterinary Association, you have not responded to our email dated 6th June 2014. As a responsible professional we do expect a reply to your continuous attacks against the Muslim and Jewish communities method of halal and kosher slaughter. Your comments appear to have no bearing on animal welfare issues, rather appear racially or politically motivated. We have highlighted below areas of blatant cruelty that need to be addressed which affect the whole life of animals in the UK and you wish to focus on the last few seconds which are undertaken most humanely in our respective religious methods of slaughter. It is due to comments such as yours that the public are mostly unaware of the fact that religious slaughter is and remains the most humane and that you wish for them to obtain comprehensively labelled products. In this way, they will remain ignorant of the daily cruelty that they are subject to, to focus on the last few seconds of their lives, making out that they are cruel when in fact they are not. In nature there is no stunning for example, but no-one complains about that and there are no campaigns by BVA to turn jungles into giant Zoos. There is less than 2.1% of the entire meat production being un-stunned compared to 4.8% Muslim population. Additionally, Muslims statistically over-consume on sheep and poultry and under-consume on beef, with zero pig consumption, so any comparisons should take these into account, but they do not. If the BVA are genuinely concerned about animal welfare, then they should address the following 10 concerns we have outlined than attempt to obtain cheap headlines. 1. The pain caused when tagging an animal last more then 5 seconds – every large farm animal has to be tagged in the UK for the purpose of identification. 5. Animal Welfare Regulations also allow emasculator or Burdizzo castration without the use any of pain relieving drugs for calves up to the age of two months. This method of castration uses a clamp which crushes the blood vessels around the testes, cutting off blood supply and causing them to die and drop off. 6. There are also numerous unreported welfare issues in the pig industry when transporting live piglets from farm to abattoir. 7. More than 30 million egg-laying birds are kept in battery cages in the UK at any one time. They are fed and and live under artificial light until their egg laying days are over when they are slaughtered. Egg to slaughter without ever seeing sun light. Wire cage sizes are just 450 sq cm – less space than an A4 sheet of paper per bird. From 18 weeks of age she will remain for a year and will produce around 300 eggs. 8. Animals on a farm are routinely castrated or dehorned without any pain relieving drugs. 9. The production of foie gras (the liver of a duck or a goose that has been specially fattened) involves the controversial force-feeding of birds with more food than they would eat. 10. The UK Home Office publishes statistics on laboratory animal use each year. In 2012, 4.11 million scientific procedures were carried out on animals in the UK. These procedures involved around 4.03 million animals. We hear much less (if anything) about the welfare issues mentioned and hear no mention of boycotting products or farms that show such cruelty. It appears that there needs to be more of a balance in their comments and avoid unfairly criticism on the Muslim and Jewish methods of slaughter as probably, they seen as soft targets. Any such criticisms they make against religious slaughter methods shows them to be ill-informed and insensitive to the halal and kosher consumers as well as ignorant of the huge halal market in the UK, Europe and the throughout the world.